Seniors, come with us and get away to sunny Walla Walla this spring! 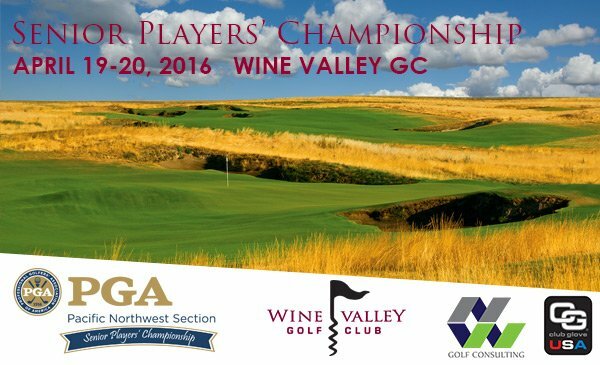 The team entry is now available for the Senior Players’ Championship at Wine Valley Golf Club on April 19-20. Director of Golf PGA Professional John Thorsnes is excited to return as host this year. The deadline for entries is Wednesday, April 13. Teams of one senior Professional and one senior amateur play together to compete for individual and team prizes. There are individual professional and amateur competitions, with gross and net payouts. The team four-ball competition will be based on gross scores only. Senior Player of the Year and Senior Hudson Cup points are available; for amateurs, the WSGA and OGA are offering Senior Hudson Cup points as well. Leave behind April showers and come play in Wine Country! Wine Valley Golf Club, which opened in April 2009, has been rated 5th on Golfweek’s Best New Courses. This stunning Dan Hixson design unfolds on a grand scale, playing over rolling hills in the shadow of the Blue Mountains. Wine Valley GC has broad fairways, dramatic bunkers, and bold, undulating putting surfaces.